Zebco / Quantum Vapor PT Baitcast Reel 100, 6.3:1, 16# Max Drag, Left Hand. Zebco Vapor, Performance Tuned Series Baitcasting Reels Features: - 11 stainless steel bearings (10 + clutch) - Infinite ACS internally-adjustable cast control - Continuous Anti-Reverse clutch - Zero Friction pinion design - CSC2 carbon fiber, stainless steel and ceramic drag system - Hard brass drive gear - Large cork/rubber handle knobs - 90mm handle Specifications: - Technique: Baitcast - Reel Size: 100 - Reel Handle Position: Left - Gear Ratio: 6.3:1 - Retrieve Rate: 27 - Bearing Count: 11 - Braid Capacity (Yards/lbs): 110/35 - Mono Capacity (Yards/lbs): 135/12 - Drag Material: CSC2 carbon fiber, stainless steel and ceramic - Max Drag: 16 lbs. Anti-Reverse: Continuous - Weight: 6.7 oz. Our Mission: Provide Quality Products, Great Prices & World Class Service. Protectorates or overseas commonwealths i. If there is a problem we will resolve it. Postal Service once an item leaves our facility. 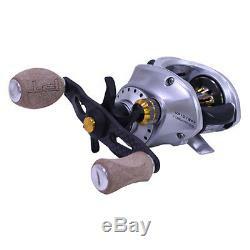 The item "Zebco / Quantum Vapor PT Baitcast Reel 100, 6.31, 16# Max Drag, Left Hand" is in sale since Wednesday, April 18, 2018. This item is in the category "Sporting Goods\Fishing\Reels\Baitcasting Reels". The seller is "timeless_landing" and is located in 63382. This item can be shipped to United States.